Want a humorous consideration for the iPad camera? With rumors swirling about iPad updates, nobody knows for sure what features the iPad 2 will have, although a camera is almost certain. The rumormill is currently going both directions on this iPad camera possibility, some iPad 2 rumors suggest that it will have dual cameras, perhaps both HD, and others say it will be 1 megapixel like the latest generation iPod touch. But while many want an HD camera on the iPad 2, this picture above shows why that might be impractical. 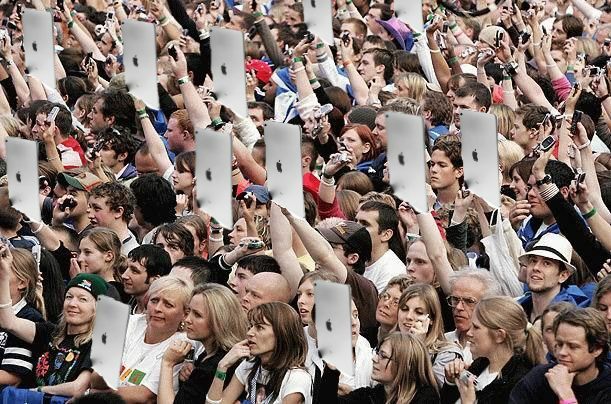 Can you imagine people holding up the relatively large iPad to take pictures? Looks a little silly doesn’t it? This is obviously a joke, but it does make a valid point in a goofy way… this will certainly be a change from regular camera use that are typically small and pocket size. Thanks to Patrick for sending in the above image! Get ready for the day where tons of people are walking around with large tablets and snapping pictures with them! As the saying goes, the best camera is the camera you have with you… right? Whether that is on an iPhone or iPad, as long as it has a camera, snap away and enjoy your photography! I would like high res for future proofing, although I expect we will get dual 1MP cams for FaceTime and PhotoBooth only. Remember the market is consumer hardware, not pro gear. If you want good pictures get 12MP DSLR, not an iPad. Wait. What most people, including this writer, doesn’t realize is that the difference between “HD” and 1MP is tiny, and that 1MP is more high res – if you look at 720p that is currently referred to as “HD” (1080p as Full HD). 720p (HD) or 1280×720 as the resolution is – makes for 0.92MP – so less then 1MP. While 1080p is 2.03MP. Also, to most of the consumers (and the guy above) – megapixels doesn’t make for a better camera. The more pixels you put into a sensor at a certain size – the more light it needs – which usually ends up in more noise. One of Nikons last gen Pro bodies was the D2H, and it was 4MP – at the same time as the D2X with it’s 12.2MP. I’d perfer a large sensor and some decent glass, which will make for a better picture. Really, who is going to take an iPad to a concert? Or even a media event? An iPad is quite cumbersome, I use mine at home, or during a meeting. But walking around with a quite expensive piece of equipment during a concert or media event is … well … stupid. You don’t wear your best clothes on a concert, you wear something comfortable, easy to move around about in. So this is where the iPhone comes in – small, easy to carry about, to hold. Basically, the person who created the image was just about quickly creating (a badly photoshopped image) to get some attention, because, again basically, he/she isn’t worth anything, other than being able to capitalize on the “complain and you’ll get more” society we live in today. osxdaily.com, you really ca do better than this kind on sensationalist content. Or you could just use a regular camera, or a cell phone and not look like a tool. I find the rear camera, if one, somewhat practical. Sure, 1 MP is not going to cut it for a professional photo, but that’s what the iPhone 4 set out to do. To a certain point.